1. Utilize more natural health remedies this year! I tried a number of natural health remedies in 2015 and I was amazed by just how effective natural treatments can be. When my husband had an eye infection last year, we tried an eye wash with a solution made of sterile water, black tea, and honey… and it really worked to cure his eye infection! Whenever I get a cold, I drink a mixture with 2 tablespoons of organic apple cider vinegar, half a cup of water, and a spoon of honey at the onset and it usually fights off the cold right away. So, it seems that there is really something too these natural remedies. Check out one of my favorite blogs Hello Glow for tips on all natural beauty and wellness solutions. 2. Visit a Korean sauna. The Korean sauna & spa experience will introduce you to a new form of relaxation. The Korean saunas feature a facility with several different sauna rooms of varying heated temperatures, all with specific health benefits. You are given a mat to lie down on for your time at the spa, and you are able to to lie down quietly in each sauna room and relax for as long as you like. These Korean saunas are really relaxing and have a ton of health benefits, not to mention being open 24 hours a day and allowing you to stay as long as you like. Give it a try at one of these locations! 3. Find an international pen pal – Get out that fancy stationery kit that’s collecting dust and write an old fashioned letter to someone across the globe. APenPals, Sassociations, and Snail Mail Pen Pals are free pen pal websites and International Pen Pals is a highly recommended, but paid website. I’m trying out APenPals right now and so far so good! There are a few people “looking for love” on the website that I had to sift through, but for a free website, it’s really pretty good. A lot of really interesting people from across the world looking to chat with new friends from abroad. I specified that I was looking for female pen pals only and that really helped. I have already connected with a great pen pal. Looking forward to building new, global friendships! 4. Try a new hobby like photography! Even if you don’t have a professional DSLR camera, you can get started with your point and click camera. Try taking photos of the natural landscape in your community or on a destination vacation. I’ve taken some amazing landscape photos on my point and click camera during tribs abroad and the photos were definitely frame worthy. I blew them up to 16×20 prints and had them framed. Photography can be a nice, relaxing hobby too. 5. Organize & redecorate your home office – I’m in the process of reorganizing my home office and personal documents right now and it feels so great to do so. Start your new year off organized! And if your home office needs a style overhaul, I can help you with that. I offer e-design services for decorating any space in your home and I am offering $300 off e-design services for January-February 2016. Contact Interiors by Jacquin to get started. 6. Add matcha tea to your diet – Matcha is a Japanese green tea powder that is a strong antioxidant and serves as a mood enhancer and metabolism booster. It’s all natural and can be drank as a hot tea or mixed into a smoothie. Most importantly, one cup of matcha tea has the antioxidants of 10 cups of traditional green tea, so that’s pretty awesome! Learn about the health benefits of matcha tea here. 8. Purchase a Himalayan Rock Salt Lamp this year and enjoy several health benefits. These lamps create negative ions which balance the positive ions emitted from our daily use of electronics. A Himalayan salt lamp can also help improve migraines, stress conditions, colds, respiratory problems, and skin conditions. Learn more about what a Himalayan rock salt lamp can do for you here. Paris Sewer Museum – Paris, France – Ok, so I like this kind of stuff, but it’s really fascinating to learn about how a sewer system works. They even have guided tours in gondolas underground for the truly adventurous… and brave. Has anyone done this before? 10. Join a recreational sports league for activities like softball, kickball, flag football or volleyball. I’ve always enjoyed adult volleyball and kickball leagues and these leagues are available in most cities. Look up one near you! Which of these ideas would you be interested in trying this year? I’m getting started with a new international pen pal (#3) and I’m really looking forward to it. 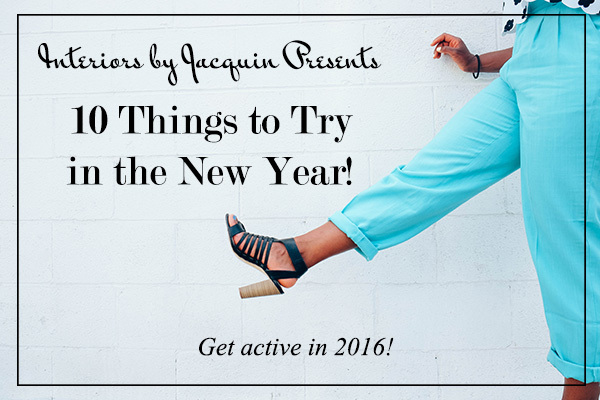 Be sure that you get active in 2016, too. It’s going to be great! Wishing you a year of growth, happiness, and adventure! P.S. If you missed the 2015 edition of 10 Things to Try in the New Year then you can take a look here for even more New Year inspiration.